Do you feel self-conscious about your double chin, but don’t want to undergo surgery? 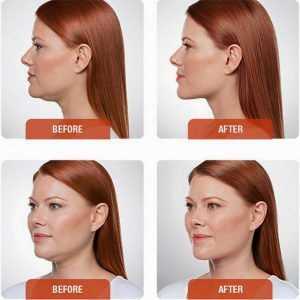 As part of our facial injectables services, Dr. Benjamin Stong of Kalos Facial Plastic Surgery is pleased to offer a revolutionary treatment to reduce chin and neck fat without surgery. Kybella injections are a safe, non-invasive and highly effective treatment method that can significantly reduce your double-chin appearance. When it comes to facial cosmetic services, you can trust that you are in good hands. Dr. Stong is Fellowship trained, dual board certified and holds an outstanding reputation for giving patients the natural, beautiful look they desire. Our Atlanta practice adopts the latest, most advanced techniques in plastic surgery so that you can receive the most comfortable and rewarding experience possible. Kybella injections are an effective and FDA approved treatment for patients who have moderate-to-severe fat below the chin, known as submental fat. The Kybella drug is a synthetic version of a bio acid that the body naturally produces. When injected into the area below the chin, Kybella can successfully eliminate fat deposits by rupturing the fat cell membranes permanently. Patients benefit from a simple and non-surgical method to reduce their double-chin appearance and restore their self-confidence. Kybella is a quick procedure that is performed in the comfort of our office. As with our other facial injectable treatments, there is almost no social downtime associated with Kybella. Depending on your specific needs and goals, repeated injections may be needed for optimal results. Patients start with two injections typically spaced 4 to 6 weeks apart. Further injections may be needed following the initial treatment. Dr. Stong can recommend the best treatment plan for you and ensure you get the results you are hoping for. Contact our office to learn more about the breakthrough double-chin reduction method of Kybella. At Kalos Facial Plastic Surgery, we offer a full range of non-surgical facial cosmetic services such as liquid eye lifts and non-surgical facelifts in our beautiful, state-of-the-art facility. We look forward to giving you the natural, youthful results that you deserve with the convenience you need. Kybella Injections are an advanced yet non-surgical method to reduce unwanted fat deposits under the chin. The FDA approved Kybella drug contains deoxycholic acid, a synthetic molecule of our body’s own bio acid that breaks down dietary fat. When injected into areas of fat in the chin and neck area, the fat cell membranes rupture and are permanently destroyed. What conditions does Kybella treat? Kybella is used to improve the appearance of a “double chin” by reducing unwanted submental fat, or fat deposits under the chin. Specifically, it is indicated to dissolve the pre-platysmal fat pad. Additionally, it is FDA indicated for moderate to severe submental fullness that results in the double chin. Is Kybella used on the body? Kybella was originally designed for use on small areas. Currently, it is only approved and used for the chin and neck area. Although studies are underway on the body, the cost of the medication may ultimately prohibit its use to treat body fat because it would require a much greater amount of the drug to be effective. Who are ideal candidates for Kybella? Kybella is best for patients who have mild to severe submental fat under the chin that they want to get rid of non-invasively. Kybella is designed to “melt away” fat and not tighten skin. Although a moderate amount of skin tightening can occur with Kybella treatments, patients with significant sagging neck skin may benefit from a neck lift or facelift instead or Kybella. In general, patients who are younger with good skin elasticity and minimal amounts of excess skin are going to benefit more from Kybella treatments. What are the primary determining factors for a good outcome with Kybella treatments? The most successful Kybella results are typically obtained when the patient has excess fat under the chin and does not have much excess neck skin. Kybella injections work by destroying fat cells, and it is not designed to significantly improve skin elasticity or tighten sagging neck skin. Older patients with excess skin and limited amounts of fat are not ideal candidates. How many treatments do I need with Kybella? Patients typically begin Kybella treatments with two scheduled injections that are 4 to 6 weeks apart. Dr. Stong will then re-evaluate the patient’s results and determine whether or not further treatments are needed. Does Kybella treat excess neck skin? Although a small amount of skin contraction is noticed, particularly in younger patients, Kybella does not eliminate excessive amounts of skin in the chin and neck area. In such patients, a facelift or neck lift should be considered for better results. What is the downtime from Kybella treatments? Patients may experience swelling and redness immediately following a Kybella injection. However, it is generally considered a no-downtime procedure. Patients have no activity restrictions following the procedure. Are there long term complications from Kybella? No long term or permanent complications were found during Kybella clinical studies. The most common temporary side effects were bruising, swelling, numbness, and swallowing difficulties, but these all resolved with time. What are surgical alternatives to Kybella? Submental liposuction is the most obvious surgical alternative for removing excess fat under the chin. If patients have both excess neck skin and chin fat, then a facelift may be more appropriate. Men often choose a direct neck lift to redefine the chin and neck area.